Permanent cards are minion-like cards that lack Attack and Health, are untargetable, are immune to all effects except their own, and take up more or less a permanent residence on the battlefield. Permanent cards are impossible to remove once they enter play, except in some cases through their own effects. While technically minions, most regular minion mechanics do not apply to permanents. 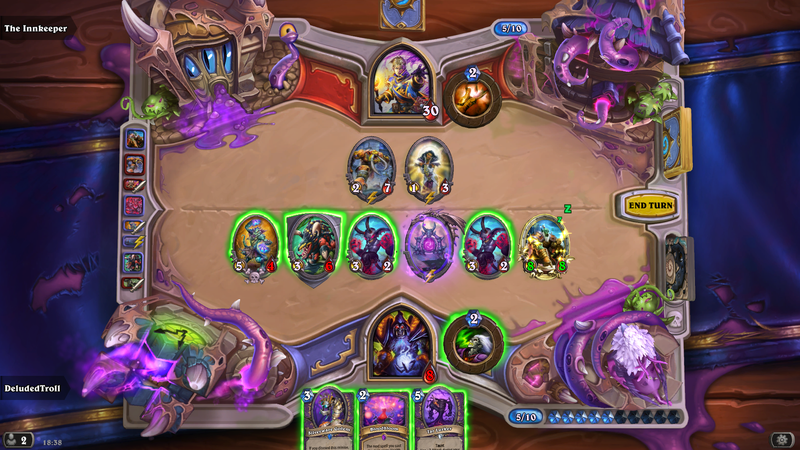 All current permanent cards are uncollectible, being either summoned by other cards, or — in certain adventures and Tavern Brawls — in place at the start of the match. Originally only seen in the Netherspite encounter in the One Night in Karazhan adventure and the specific Tavern Brawls Party Portals!, The Dark Wanderer and Yellow-Brick Brawl, permanent cards were first made available in regular Play mode with the release of Journey to Un'Goro. Permanents cannot be targeted, either by attacks or effects, including random target effects, such as Mad Bomber or Mind Control Tech. Permanents do not count as eligible targets for triggered effects such as Blood Imp. If a triggered effect requires a minion target, it will not activate due to the presence of a permanent alone. If a Deathrattle such as Zealous Initiate that requires a target is activated with only a permanent on the board, it will have no effect. Permanents are not susceptible to any kind of effect, including Area of Effect, such as Deathwing, DOOM! or Brawl. Because they cannot be affected by outside effects, permanents as a rule cannot be destroyed, damaged or transformed. However, permanents can be affected by their own effects. For example, Sherazin, Seed is immune to all outside effects, but can transform itself into Sherazin, Corpse Flower. Permanents take up a place on the battlefield like regular minions, and count toward the 7 minion limit. Permanents are not considered minions for most purposes, but sometimes contribute to "minion counting effects". See card pages for individual notes on how they treat permanents. Effects include permanents in their counting if they have conditions that otherwise could not be met due to the permanent taking up a spot on the battlefield. Example: Reliquary Seeker's Battlecry activates with 5 other minions and a permanent on the battlefield, despite requiring "6 other minions". Example: Frostwolf Warlord is played with four minions and a permanent in play. Its Battlecry gives it +4/+4 for the minions, but nothing for the permanent. Permanents are not affected by positional effects such as Flametongue Totem or Cone of Cold, but still take up a spot for the purposes of determining adjacent minions, effectively blocking their effects without consequence. Permanents cannot attack, although their card text may allow them to perform other actions such as summoning minions or buffing adjacent minions. Because of this, all current permanents possess either triggered or ongoing effects. When you restore 5 Health, awaken this minion. The following cards are not available outside of their respective Tavern Brawl or boss encounters, are not available to players, and have no impact on the game in general. However, given the rarity of permanent cards, they are presented here for completeness. ↑ 2.0 2.1 Peter Whalen on Twitter. (2017-03-19). ↑ Peter Whalen on Twitter. (2017-03-19). ↑ 5.0 5.1 Peter Whalen, 2017-03-17, 9:45 https://www.twitch.tv/videos/129436723 - They're very, very permanent. ... They are untargetably permanent. Even in testing, the only way I know to get rid of one of them, is to concede the game and start over. ... I know when our engineers were trying this out ... it was actually kind of irritating for them, because they can't get rid of it any other way. They just have to concede and start a new game. ... But as far as actual gameplay goes, you just cannot get rid of it. ↑ Dean Ayala on Twitter. (2017-03-20).